What is your favorite Power Query book? 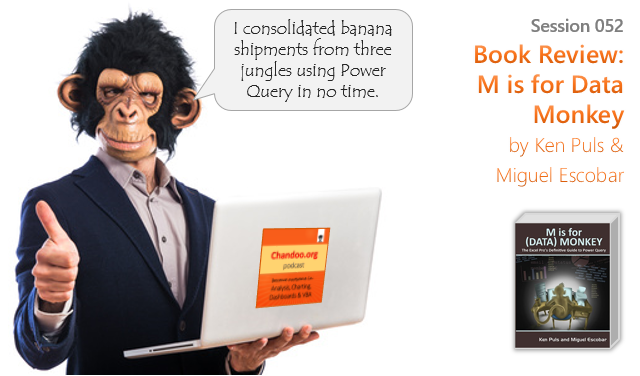 Have you read M is for data monkey? How do you like it? What other books on PQ do you read? Please share your opinions and suggestions in the comment box. Hi Mike, I think you misunderstood. Neither the friendship nor very small sales commission impacted my review. I genuinely like the book and want to share it with the podcast audience. I have spend first 12 minutes of the podcast (almost 40%) just talking about Power Query in general. Even while talking about the book, I emphasized on how the book helps you navigate PQ and use it better. I have read 2/3rds of the book and I know valuable content when I see it. You can take a call by reading it yourself. PS: Almost all leading and new Excel authors are my friends. So according to your logic, I should not review any books. As MVP's we are all part of a quite vibrant community where we meat, correspond and solve issues with each other regularly. It is not uncommon to wake up and find I have 50 emails from MVP's who are discussing any number of Excel issues. Next week I have a Meetup schedule to catchup with other Excel people on Financial Modelling in Perth, I catchup with teh MVP's in Australia once a year and we have a Global MVP conference in the USA once per year. Once you delve into Excel you quickly realise that none of us are Expert, we maybe in one small area but Excel is so huge that we use/need this community to spread and learn ideas. Enjoyed your podcast. Sounds like you and your family had a great vacation, as well. Enjoyed the podcast too. I've read Power Query for Power BI and Excel (Chris Webb) which I'd recommend and will get round to this one at some point soon. I think it's the future and it's worth swotting up on it! The book is pretty good, and powerquery is an absolute must have for the power pivot era. Hi, I am using Excel for a survey and need to be able to disable and enable cells based on responses from other cells. My worksheet is protected and all cells are locked, except the ones with the answer. Nothing fancy but need to know if its possible to run a script in the background and as the user answers questions, other question rows appear? Is M still applicable for Power BI Desktop of only for Excel? Please advise books for VBA, TO become an expert in VBA from Beginner. the book which also shows easiest way of learning.